My parents used to say that I was like a radio in the car when I was growing up. I would start to sing as I sat down in the back seat and not shut up until we arrived at the destination. Anya was pretty much the same way. Tiffany would say, "Mamma, please make her stop singing. "And I would try to make it as comfortable as possible for all parties, but remembering my childhood experiences and that no one ever asked me to shut up, I answered, "No, let her sing. She is enjoying it so much." Music is wonderful, but music can also be horrible. Am I right? Fortunately we all have different tastes when it comes to music, but I believe that music gets into your head, heart, and soul and makes a difference - one way or another. He may have won top regional and state science-fair honors, but probably at least some of his friends aren't talking to him. Sixteen-year-old David Merrill, a student at Nansemond River High School in Suffolk, Va., thought that the loud sounds of hard-rock music must have a bad effect on its devoted fans and came up with a way to test that damage.Merrill got 72 mice and divided them into three groups: one to test a mouse's response to hard rock, another to the music of Mozart and a control group that wouldn't listen to any music at all, rock or classical.The young vivisectionist got all the mice accustomed to living in aquariums in his basement, then started playing music 10 hours a day. Merrill put each mouse through a maze three times a week that originally had taken the mice an average of 10 minutes to complete. And should we believe in the lyrics of songs we hear? Karen Carpenter sang about how rainy days and Mondays got her down. I don't agree. I really like Mondays. And I really like rainy days. Funny thing how different we all are. I have noticed how I react when I have prepared myself spiritually for an assignment, like interpreting a speaker. I cannot listen to just any kind of music in the car on my way there. The feeling I get if I listen to music that doesn't build me up should be a beacon of what I should listen to on a normal busy day when I don't really notice what's on the radio. I have to mention lullabies. I have sung my share for our children. It's a wonderful opportunity to spend a few minutes (or an hour and a half) with a little one before they go to sleep. I almost sang myself to sleep singing children's-, Disney -, and Christmas songs. Yes, Christmas song make great lullabies. The most effective lullabies were "Stay Awake" and "Feed the Birds" both from Mary Poppins. Those two made my children go to sleep. A few weeks ago I tried to make up a new lullaby while driving in the car. I got really drowsy. I yawned and wanted to go to sleep. Not good when driving. Don't do that. 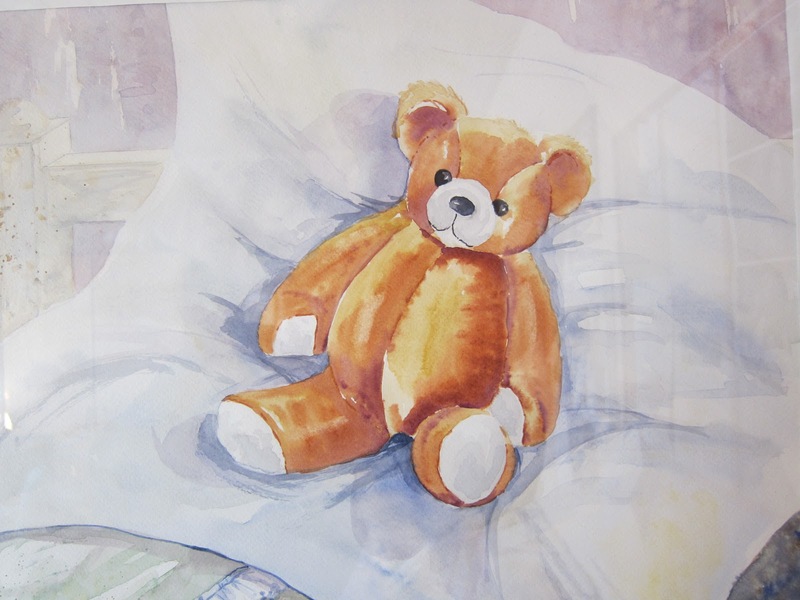 Today's water color is of a bear going to sleep, probably waiting for someone to sing to him.